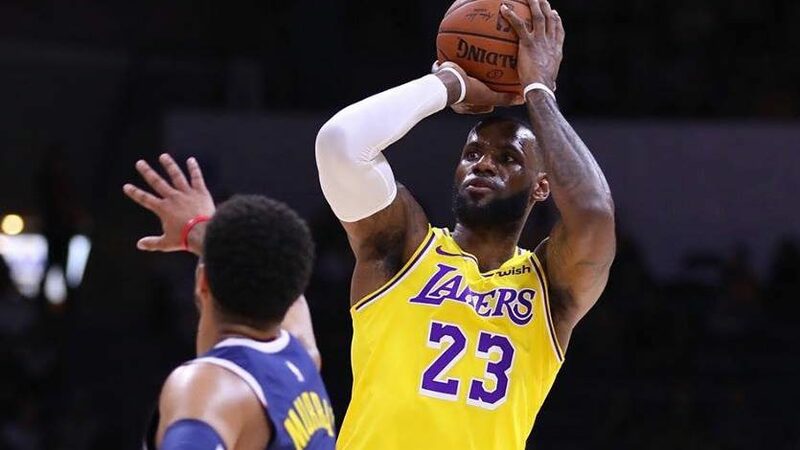 LeBron James scored nine points in 15 minutes, 20 seconds, all in the first half, in his debut with the Los Angeles Lakers, a 124- 107 loss to the Denver Nuggets on Sunday evening at Valley View Casino Center. James made two of six shots, both 3-point baskets, and three of four free throws in the preseason opener for both teams. He pulled down three rebounds and had three assists and one turnover. The Lakers outscored Denver by one point while James was on the court. The teams will meet again Tuesday at Staples Center. Center JaVale McGee, who like James joined the Lakers in the offseason as a free agent, led the team with 17 points in 19:54. Forward Brandon Ingram added 16 in 26:48. Reserves Kyle Kuzma tallied 15 in 24:22 and Lance Stephenson tossed in 12 in 20:32 before a sellout crowd announced at 13,565. Forward Juancho Hernangomez led seven Nuggets in double figures with 19 points in 23:05, including a game-high five 3-point baskets. The Lakers trailed 34-29 at the end of the first quarter and 66-54 at halftime, then outscored Denver, 15-3, in the opening 5:01 of the second half to tie the score, 69-69. A Stephenson 3-point basket gave the Lakers their only second half lead, a 75-73 advantage with 5:20 left in the third quarter. Updated at 11:48 p.m. on Sept. 30, 2018.